As a wedding planner I have definitely noticed a trend in breaking away from wedding traditions. There are fewer and fewer "this is how it HAS to be done" moments which gives a lot of freedom to the couple to really personalize & enjoy their big day. The most common traditions being cut out are the bridal bouquet and garter tosses. Which makes sense because they both take time away from guests dancing and the garter toss in particular may make some older guests feel uncomfortable. The most surprising new tradition or option for couples is the "first look". This is so new and non-traditional that a few of my brides had not heard of it until I mentioned the option. SO here are all the details. The "first look" is traditionally captured when the bride walks down the aisle towards her groom, it is the first look that the groom gets of his bride. 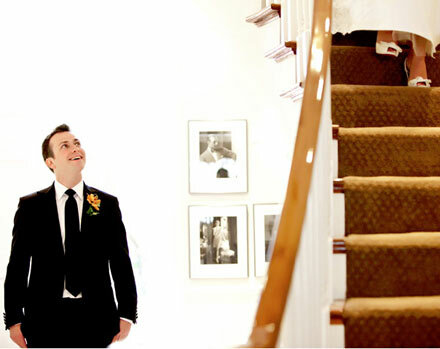 The "first look" photos are for couples who are ok with seeing each other before the ceremony. The photographer(s) and the planner set up the couple so that the first time they do see each other it is caught on camera. This is a great idea because the bridal party is able to get a lot of photos done before the ceremony which saves time during the traditional "picture time" known as cocktail hour. Couples who choose the first look option usually have large bridal parties and/or families that will take up a lot of time for formal pictures or the couple just wants to enjoy their cocktail hour with their guests and have time to relax after the ceremony and before the reception. There are a lot of ways to set up the "first look" shot but most of all, have fun with it! Here are a few pictures for inspiration, two couples are Felicity C Weddings clients from this year and the other two were found online. Enjoy!